"My passion for hot rods began when I found a 1927 Model T coupe on an old rancher’s land. I talked him into selling it to me for $50, and then took it back to my dad’s mechanic shop and started building it the best way I knew how at the time. I made it drive, but quickly realized what I could have done better. Ever since then I have been building and re-building hot rods and custom cars. 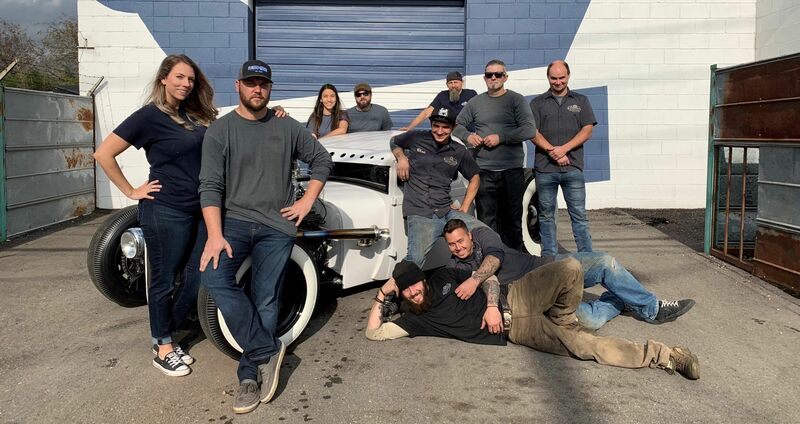 Opening a hot rod shop has been like a dream come true. I get to come to work every day to be surrounded by some of the coolest cars and make them even cooler. I have a great group of guys to work with and great wife who has been by me as we built the shop from the ground up. I’m excited to see where we will go from here." “I’m Jennifer, AKA the shop mama, and I handle financials and administrative duties. My hardest job here at Empire is keeping the boys in line! I have had a love for cars for most of my life. Kris introduced me to hot rods, and the rest is history. We take pride in what we do and appreciate the support of our team and our clients!" "I've been in the auto industry for many years. My passion for hotrods is what brought me to Empire Garage. It doesn't feel like work when I'm when I'm doing what I love." "I'm majoring in Marketing and joined the Empire team to help with brand development and office administration. I'm the glorified shop babysitter and run a tight ship."